Groupon is a runaway success, generating revenue at $2 billion annual run rate. But is it sustainable? To answer that question, Utpal M. Dholakia, a marketing professor at Rice University, surveyed 150 businesses that used Groupon. Of the people he spoke with, 66% found Groupon to be "profitable." 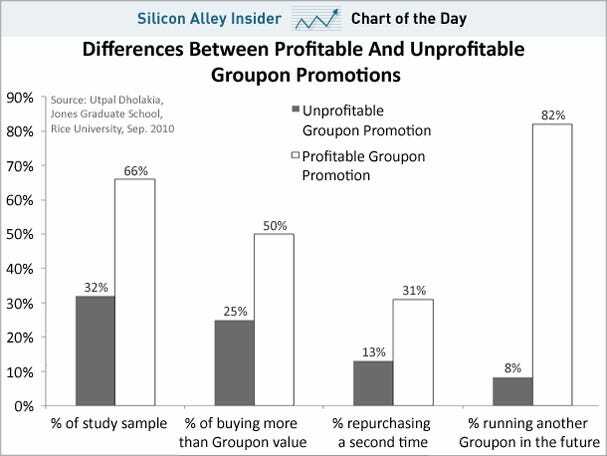 In his study, profitable means the Groupon generated enough additional sales to justify the initial discount. In other words, it's looking at the long term implications of using Groupon for a business. The vast majority of the companies that had successful Groupons said they would do it again, so it appears that Groupon has a sustainable business on its hands.